Located in the lively town of Gustavia, St. Barts, Gustavia Villa has the advantage of being “in town” while still being very private. The home is perfect for honeymooners or other couples, and its location is its best feature. Overlooking the Caribbean Sea, the views from the covered deck are exceptional, and its proximity to town means it’s just minutes to restaurants, shops, and more. The villa has one bedroom and one bathroom, a large fully equipped kitchen, indoor and outdoor dining areas, and a comfortable living area with a TV. Outside, there is a private pool, hammock, and outdoor furniture for enjoying the view. Gustavia Hill is a comfortable 1-bedroom, 1-bath villa that is attractively furnished in a contemporary style. 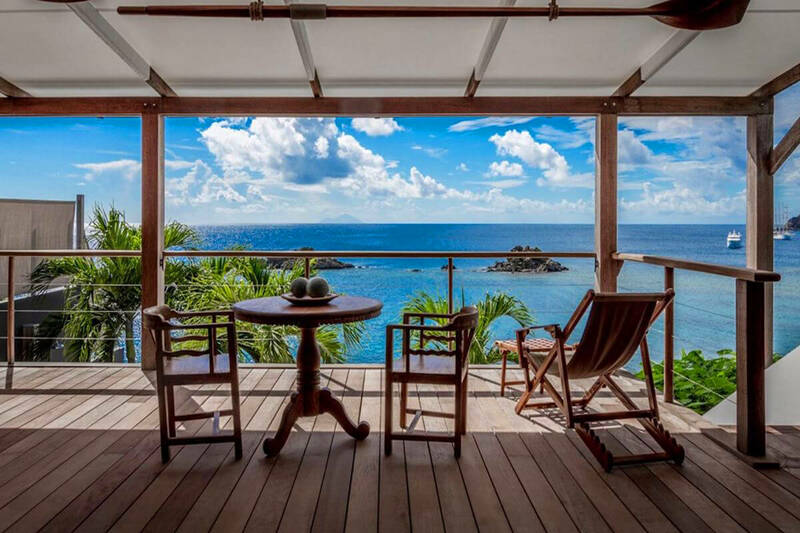 Conveniently located in Gustavia, this villa offers privacy and sunset and ocean views. Its setting on the coast above the western side of the harbor in the area called La Pointe makes it the ideal location to be in town, but yet retain its privacy. Overlooking the Caribbean Sea, the villa is near the Gustavia downtown, with shops, restaurants, and the yachts in the harbor. There is a patio outside with a relaxing hammock as well as a private pool. This villa is perfect for honeymooners. espresso machine, fruit squeezer; flat-screen TV with Canal Satellite, home cinema, WI-FI, exterior shower, large private parking, beach chairs, beach umbrella, cooler, beach towels.